Right now this is the most fragrant part of our property. 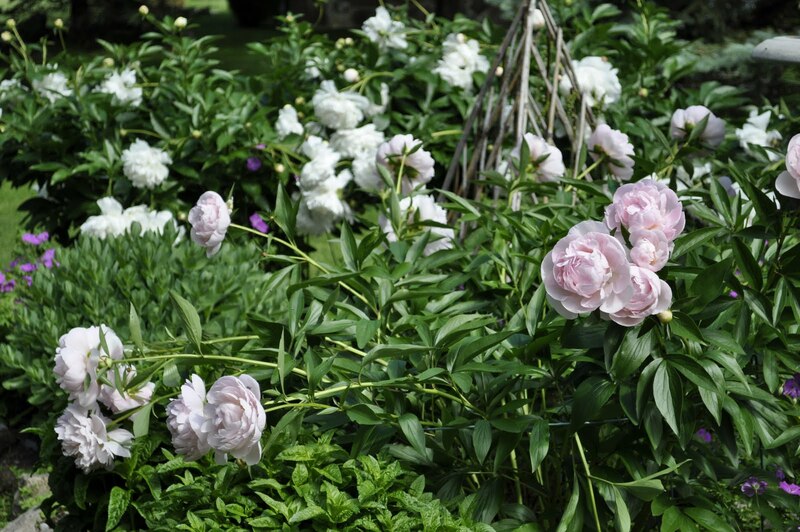 As you approach this flower bed you are hit by a wall of fragrance wafting from the white and pink peonies. They are so lush and heavy it is impossible for them to remain upright, inspite of our efforts to support them. I have a couple of shots of this area of our garden (poor shots - because it was very hot and as my forehead perspired my glasses fogged up and I was too lazy to find kleenex to wipe my brow and glasses so I could make the required adjustments - blah, blah, blah - but you get the idea of the setting from which I gather my peonies) and then a few creative manipulations where I apply some of my home-made textures to these gorgeous specimens. Talk about gilding the lily! 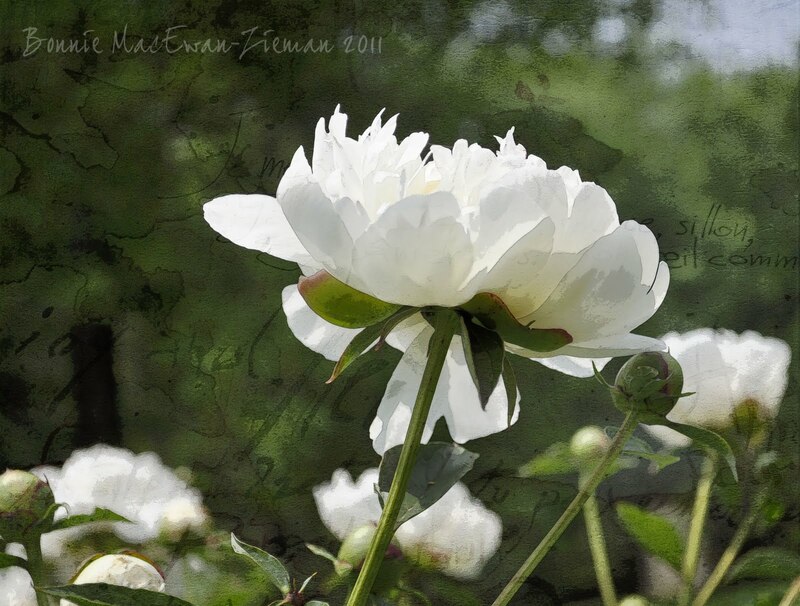 Below are some of my 'artistic' edits of these peonies. Since I have noticed that people sometimes like to identify their favorites, I will number them to make it easier for you. :) You can click on the images for a larger view. 1. Sharpened and a Filter adjustment - no texture. 2. Some adjustment for light and the addition of a texture with French script describing a love affair. 3. A different texture and adjustments to give a bit of a painterly feel. 4. 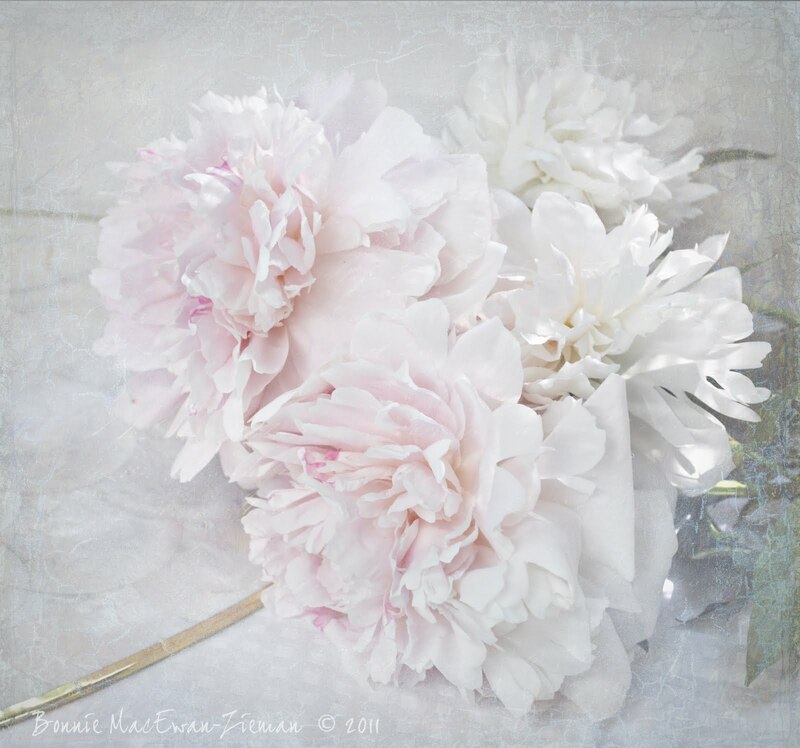 Cut peonies lying in my studio. A texture (presently offered as a free download HERE) blended in Screen mode in PS. 5. Now here I am really gilding the peony! This is a texture of mine made with a copyright-free image from The Graphics Fairy. 6. 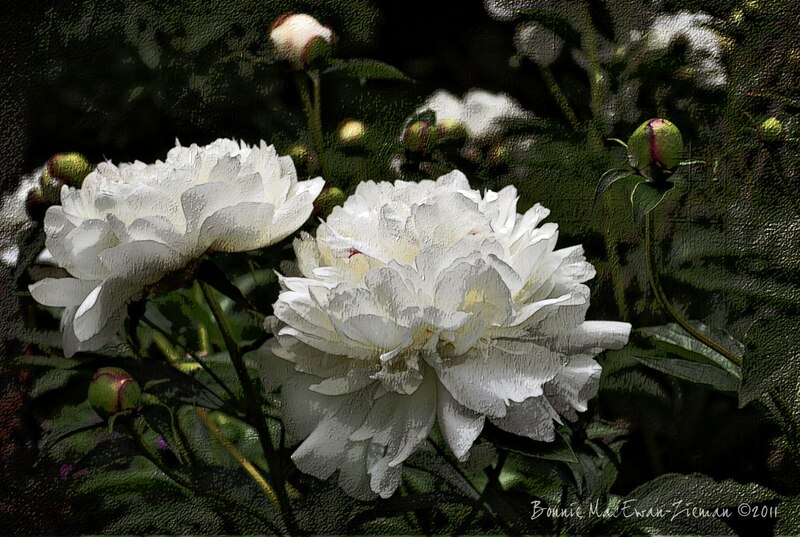 The addition of a dark, rich texture (par moi) where I chose to leave quite a bit of it on the flowers. 8. 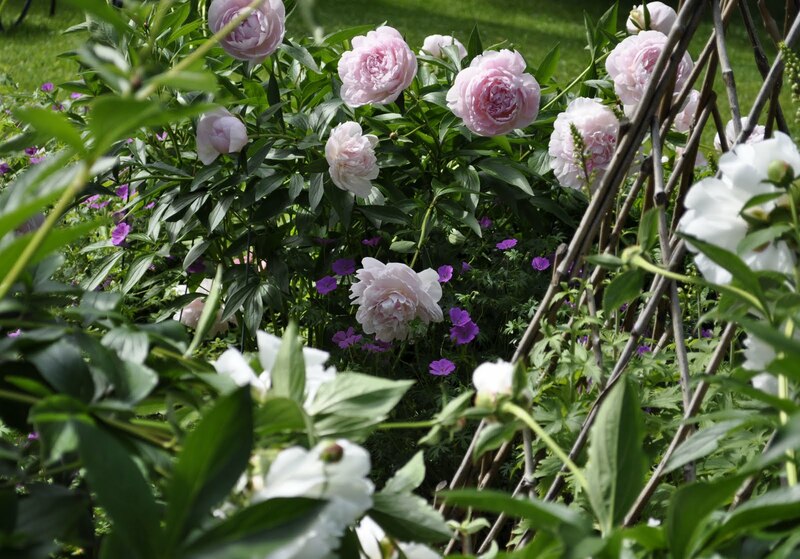 Here are 'spent' peonies. 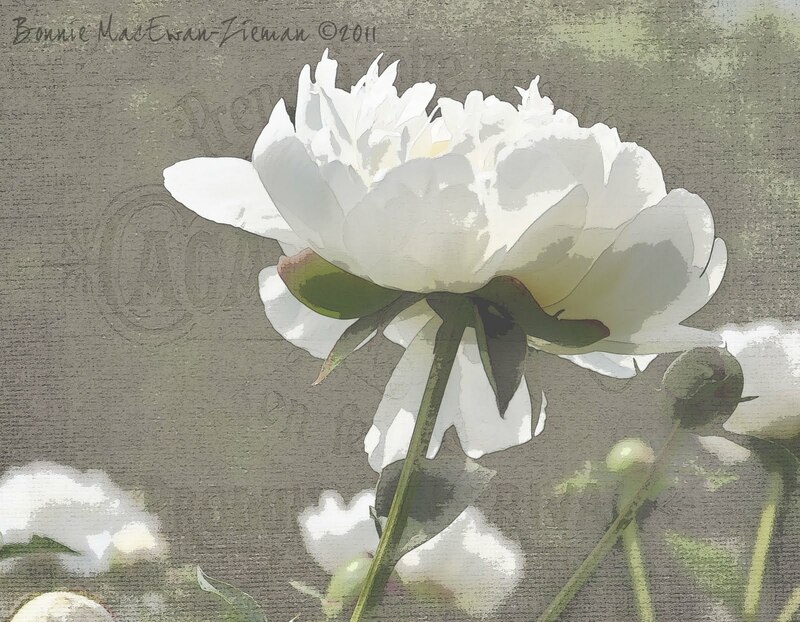 I have discovered that faded, old flowers make fabulous subjects for photo art. This is a dark texture, but blending alters away much of the darkness, leaving only textured interest. 9. 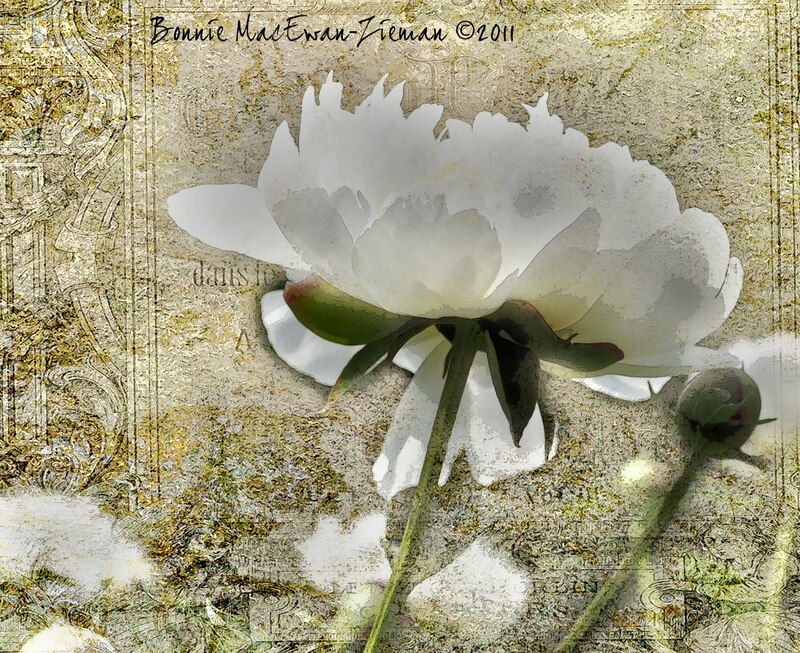 Another of my textures made with my own photographs and material downloaded for free from The Graphics Fairy. to all the dear Dads out there! Hi Bonnie - oh my, your garden is SO beautiful. 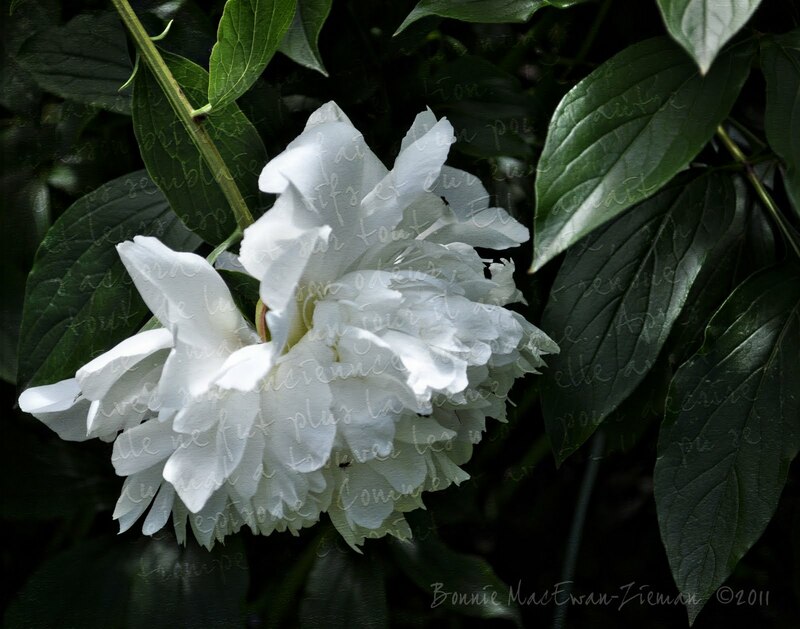 And your pictures are exquisite - I could smell the lovely fragrance - they were SO real. 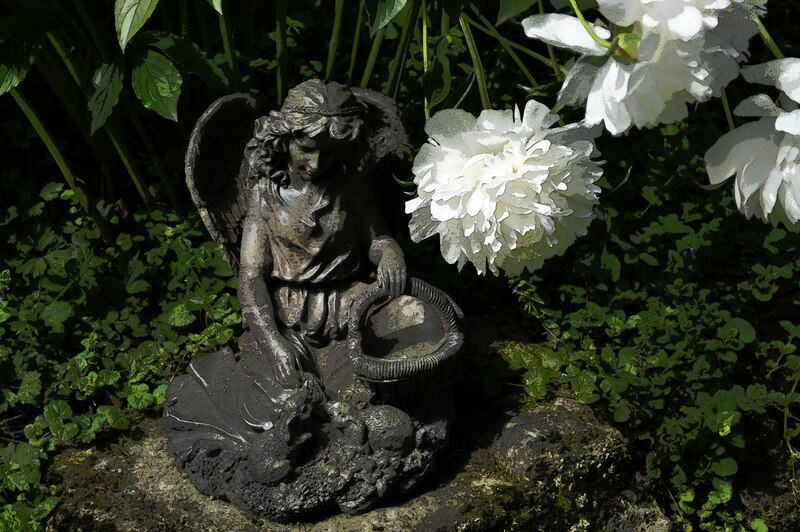 "Thank you" for sharing your beautiful world/garden. Gorgeous!! 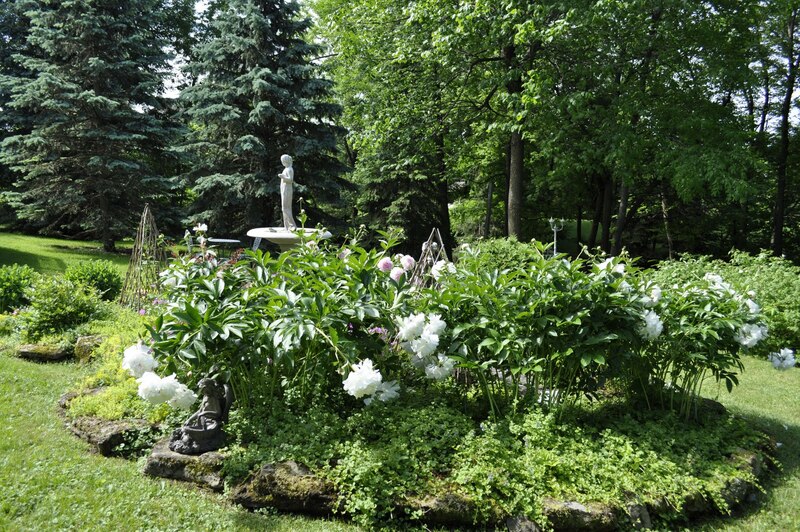 !I envy your garden and peonies are a favorite. The photography is impressive. I studied them all several times and decided that # 4 is my favorite. It has an ethereal feel. Wow Bonnie, your garden is amazing. What a gorgeous setting in which to thrive and meditate. Sweaty brow notwithstanding, your photos really do communicate the serenity and beauty of your surroundings. I really did laugh out loud at your description of the foggy glasses and blah, blah, blah. The images are divine. Real works of art. 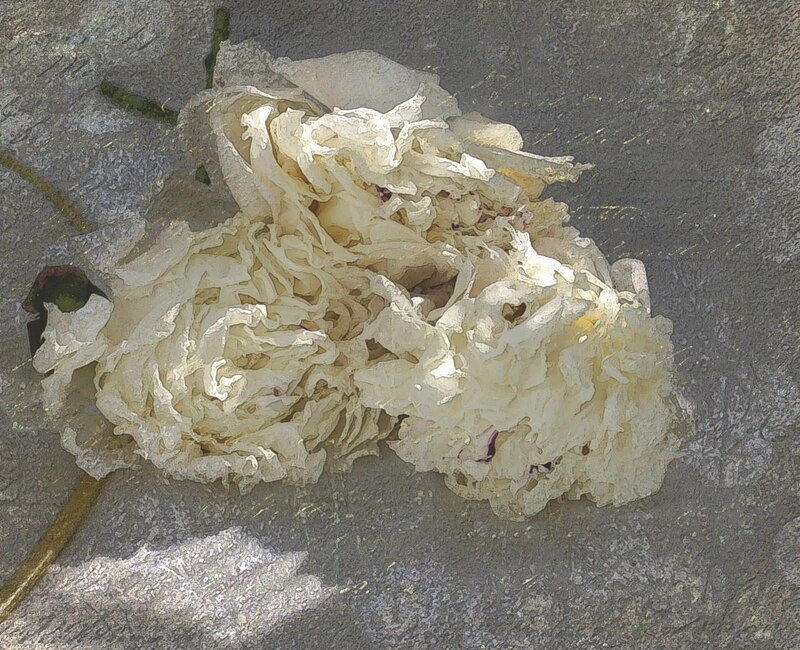 Gilding the peony is a good thing from what I see. That image is especially gorgeous. WOW you have a beautiful yard! Your photos are all so beautiful - I really couldn't pick just one! Truthfully! I'm digging every one of them, Bonnie! I think #2 is my favorite due to the French script but there's something about those faded ones that draw me. I have some cut flowers from the neighbor's garden so I think I'll experiment with them when they're done. It's amazing how our glasses can dictate what we do at times...loved your description of this! they are such beautiful flowers but they don't grow down here. Wow! You take and make some amazing photos. 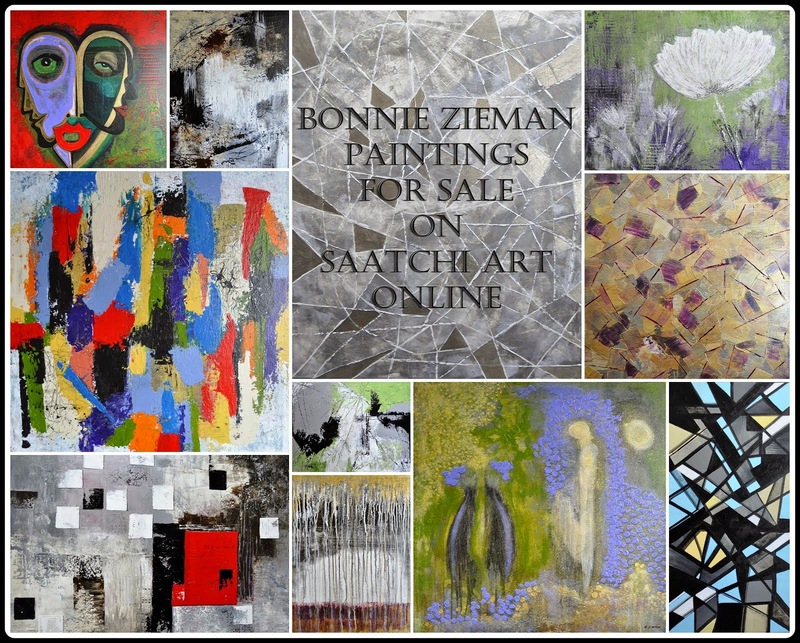 All the images are gorgeous, Bonnie, yours no less than the one's created solely by nature. Have a good week! Wow, it´s amazing, what you created. You've made this series of pictures very interesting and very pretty. 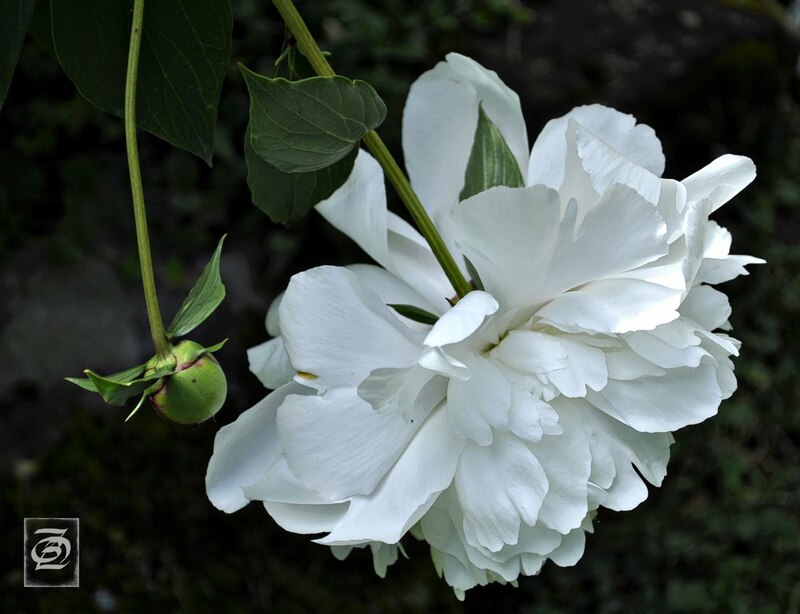 Peonies are such a bother, they are beautiful, of course, but for all the effort involved they last a relatively short time. I cut them and bring them into the house; in a vase they last remarkably long, if you cut them when they have only just opened. They make a spectacular display.